After completing my BFA at Adrian College in 1976, and then working as a studio potter for fifteen years, I am finally able to create the mixed-media baskets I have always dreamed about. Unhampered by the limitations found with clay-only forms, texture, color, shape and size have become a satisfying reality. My baskets are made with a combination of three materials: clay, fiber (reed), and wood. The clay is a high fired stoneware with dipped, brushed, and poured glazes. The challenge here is to have a clear vision of the completed basket before starting the piece. Using traditional wheel-throwing and hand-building techniques, I finish the clay parts first. Once I have completed that I begin to shape and bend the green oak ribs for the larger baskets. On other pieces, I position and glue reed or dowel spokes in place. This stabilizes the form for weaving. The final process is the weaving of the entire spoked area. I select the natural and dyed reed and weave plaited and twilled patterns. I will often choose palm, vine rattan, red osier, willow, or birch bark as accents to add a more natural feel and texture to my baskets. Fascinated by exploring new and exciting shapes, I have been continually inspired to work with the vessel as form. Breaking from the clay-only vessel and exploring the endless possibilities afforded by basketry as an art form has allowed me to explore shapes and textures that were unattainable to me in the past. Ann Arbor Summer Art Fair, Ann Arbor, Mich.
"Art and Design Entwined" April 6 -May 9, 2008. The Jordan River Art Center, East Jordan, Mich.
Michigan Guild, Ann Arbor, Mich.
Stephen Kostyshyn (Kos-ti-shun) has been a full-time professional potter since receiving his BFA from Adrian College in 1976. He apprenticed with Brumm’s Studios and Todd Warner Studios in Charlevoix, Michigan. Steve worked with porcelain from 1981 to 1993; then with Majolica-influenced stoneware from 1993 to 1997. He also made one-of-a-kind decorator pieces. 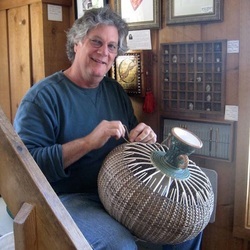 More recently Steve has been working on Mixed-Media Basket Vessels. Combining clay, fiber, and wood. This exciting new direction has opened a door to explore texture, color, form and size not possible with clay only pieces. In his rare spare time, Steve plays guitar, builds web sites, and loves to tinker on the farm where he lives and works.